Although I have been painting professionally since 2005, my excitement for art has spanned many more years. In particular I have enjoyed drawing and painting animals – wild and domestic, large or small since my college days. It is a joy for me to be able to depict wildlife in their natural surroundings. Nearly all of my paintings are watercolor, either on paper or Aquabord. Over the years, I have developed watercolor techniques that suit my style of realism. I try to portray each of the animals in as realistic a manner as possible…the details of their feathers, the colors of their coats, and the brilliance of their eyes. There is nothing so penetrating and expressive as an animal’s eyes which is why I concentrate on faithfully depicting that window into their world. I’m fortunate to live in an area of Arizona’s Sonoran Desert where humans have only lightly left their imprint. Wildlife passes near my studio windows at almost any time of day. Hawks and owls nest nearby. Tiny quail chicks scurry after their parents. Jack rabbits and cottontails skip from one bush to the next. Snakes slither out of their rocky hiding places, javelinas, coyotes and even an occasional bobcat amble through the cactus and brush in search of their next meal. It is a magnificent place for a wildlife artist. Received “Best of Show” and “First Place” at Gold Rush Days in Wickenburg, AZ. 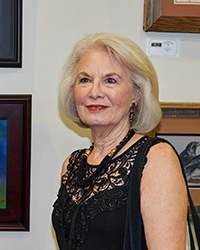 Awarded the “Artist’s Award” at the Wickenburg, Arizona Fine Arts Festival. Hidden in the Hills Art Show – my sixth year in this unique show. Two of my paintings “Show Time” and “Peeking Through the Palms” were featured in Southwest Artmagazine’s November, 2012 issue. Received “Artist’s Award” at the Wickenburg Arizona Fine Arts Festival.